See also: Mother Vineyard; Scuppernong Grape. North Carolina is home to the nation's first cultivated wine grape, the scuppernong, which is a variety of the muscadine grape (Vitis rotundifolia) and grows in abundance from the coast to the foothills. The "Mother Vineyard" of scuppernong grapes was discovered on Roanoke Island by members of the Raleigh expeditions in 1584. For nearly four centuries, North Carolinians have harvested the scuppernong and other grapes to produce wine for private and commercial use. One of the earliest accounts of wines produced in the colony came from the journal of Irish physician John Brickell, who resided in Edenton in 1737. Brickell noted that "there are but few vineyards planted in the colony at present, for I have seen but one small one at Bath-Town and another the Neus (New Bern) of the White Grape. . . . I have drank the wine it produced and it was exceedingly good." Several southern botanists and farmers, including Thomas Jefferson, tried to encourage production of grapes for wine throughout the late 1700s and early 1800s. Farmers who chose to cultivate scuppernongs found it a lucrative business. The agricultural journal the Star reported in 1811 that, during the previous season, 1,369 gallons of wine had been manufactured in an unnamed North Carolina county. A single scuppernong vine can cover an entire acre and produce, even without cultivation, a ton of fruit yielding five barrels of wine. The American Farmer reported on 1 Oct. 1819 that "wine is made along the Cape Fear River from Fayetteville to the sea. . . . and the farmers use it as freely as cider is used in New England. It is common for a farmer to make 8-10 barrels of wine annually for his own use, and many sell considerable quantities." For the average North Carolinian during this time, however, the drink of choice was "hard" liquor, whiskey or brandy that was readily available everywhere in the region. For most people, wine was a tonic concocted of blackberries or dandelion petals that was used primarily for soothing the bowels. Wine from the scuppernong and other muscadine grape varieties was largely a coastal specialty, enjoyed by gentry and small farmers who produced homemade wine from their backyard vine. In the early 1800s, there appears to have been no standard method of producing wine. Some vintners pressed the grapes with a cider press, then mixed four parts unfermented juice with one part applejack brandy. Others let the must (the crushed grape mixture) ferment, then drew it off into clean casks, where they mixed three parts juice to one part brandy. Some added honey, while others found the wine's distinctive, musky taste to be sweet enough on its own. By 1840 grape and wine advocates had encouraged grape plantings, as vineyards and wineries were flourishing across the eastern half of the state. Prior to the Prohibition era, in fact, North Carolina ranked as the leading wine producer in the United States. Before the Civil War brought wine making to a halt, there were 25 wineries in the state, with such names as Tokay, Medoc, Cognac, Niagara, Vina Vista, and Catawba. Medoc, located in Halifax County, was the state's largest winery, producing 60 barrels annually. After the war, vineyards and wineries again sprang up at Castle Hayne, Conover, Eagle Springs, Edenton, Gibson, Holly Ridge, Icard, Littleton, Louisburg, Manteo, Murphy, Peachland, Pettigrew State Park, Samarcand, Tryon, Warrenton, and Willard. In 1900 Paul Garrett, a former Medoc salesman, established his own winery at Littleton. During the next 16 years, he built a wine empire created largely on the distinctive taste of the North Carolina scuppernong. His Virginia Dare red and white wines were the best-selling wines in the nation and won the grand prize at the Louisiana Purchase Exposition in 1904. Garrett's empire, whose production headquarters moved to Virginia and then New York as the southern states became dry, managed to outlast Prohibition. His North Carolina wines gradually lost their distinctive flavor, however, as dry congressmen continued to discourage planting grapes as a cash crop. Upon Garrett's death in 1940, the winery went out of existence. Wine and grape production in the state remained at an all-time low until 1950, when farmers in Onslow County planted 25 acres of scuppernongs and then established a winery as a market for their grapes. Encouraged by their success, farmers across North Carolina began planting grapes for wine production. 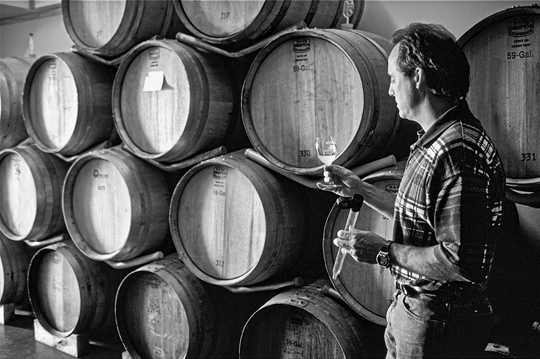 In 1972 Jack Kroustalis's Westbend Vineyards in Lewisville became North Carolina's first winery to produce wine made from the same varieties of grapes used to make California and French wines (Vitis vinifera). North Carolina's most famous home became the site of what would become one of the country's most visited wineries when, in the early 1970s, horticulturists at the Biltmore Estate near Asheville began experimenting with French hybrid vines in the estate's gardens. In 1979 the first bottles of Biltmore Estate wines sold out as quickly as they were offered for sale. Biltmore heir William Cecil hired noted French wine maker Phillipe Jourdan to direct the wine-making operations and created a multimillion-dollar winery and tasting room on the estate grounds. Biltmore Estate annually produces about 75,000 cases of wine in 15 varieties and welcomes thousands of visitors through its doors. By the early 2000s several successful wineries were operating in the state, including Bennett Vineyards, the Biltmore Wine Company, Chateau Laurinda, Dennis Vineyards, Duplin Wine Cellars, Germanton Vineyard and Winery, Martin Vineyards, North Carolina Waldensian Winery, Silohouse Vineyard and Winery, the Teensy Winery, Villar Vintners of Valdese, and Westbend Vineyards. Annually these wineries produce approximately 250,000 gallons of wines made from both European and native grape varieties. North Carolina-produced wine sales contribute about $4 million to the economy each year. Clarence Gohdes, Scuppernong, North Carolina's Grape and Its Wines (1982). Carol Byrne Hall, "Fine Wine Finds Its Time," Raleigh News and Observer, 4 Sept. 2001. Thomas Pinney, A History of Wine in America from the Beginning to Prohibition (1989). Dudley Price, "Industry Needs Aging: N.C. Wineries, Still Just Getting Started, Struggle for Recognition and Respect," Raleigh News and Observer, 22 Jan. 2005. Pamela Watson, Carolina Wine Country: The Complete Guide (1998). "North Carolina Wine." North Carolina Department of Commerce. http://www.ncwine.org/. (accessed June 27, 2012). Helsley, Alexia Jones. A History of North Carolina Wine: From Scuppernong to Syrah. History Press. 2010. Tingen, David. "North Carolina Wines." Raleigh Bottle Club. February 4, 2011. http://www.raleighbottleclub.org/index_files/ncwine.pdf (accessed June 27, 2012). 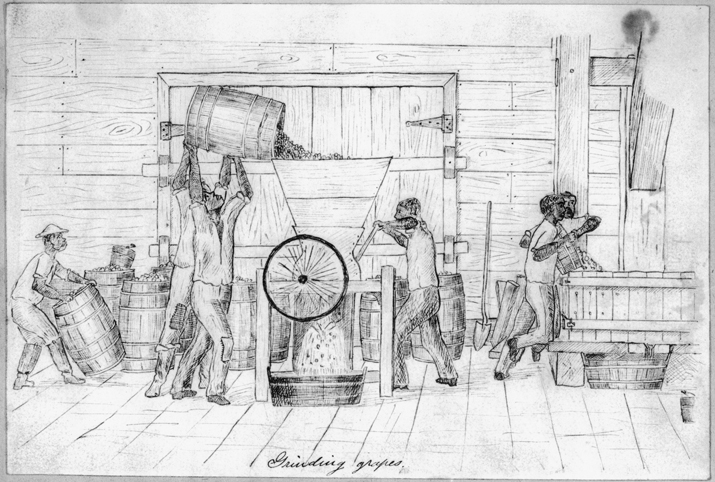 An 1870s drawing of grapes being crushed at the C. G. Garrett and Company Vineyards and Wine Cellars in Halifax County. North Carolina Collection, University of North Carolina at Chapel Hill Library. Courtesy of Christopher Terrell. Sampling wine at Westbend Vineyards near Winston-Salem. Photograph courtesy of North Carolina Division of Tourism, Film, and Sports Development.